"Some are adorned in practical details with a casual nod to history; while others are minimalist masterpieces." 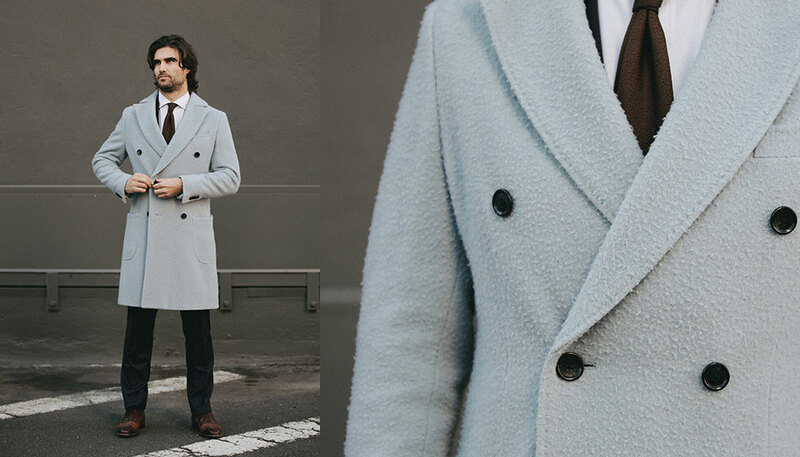 Great overcoats come in several shapes and styles. Some are adorned in practical details with a casual nod to history; while others are minimalist masterpieces. The key traits that the most striking of overcoats share are craftsmanship in tailoring alongside beautiful fabrics – making the most of its wearer’s silhouette while crafting a warm, practical and memorable garment that can potentially last for many winters to come. Sometimes, the key to sophistication is simplicity. This overcoat is perfectly proportioned across the shoulders – the jacket draping in an elegantly continuous line due to a combination of good craftsmanship and well-weighted fabric. Notched lapels and three-roll-two buttons accentuate the clutter-free design, and best worn over a made-to-measure tailored double-breasted suit. Details matter, and small points of difference can make the largest impression upon meeting others with an eye for sartorial detail. 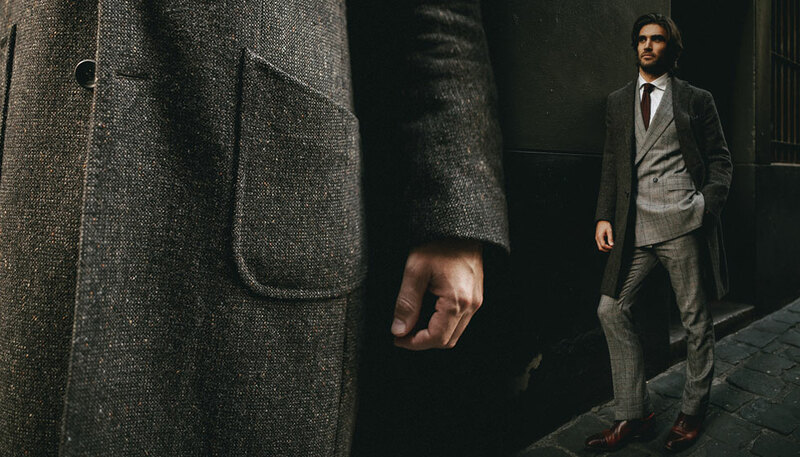 This double-breasted overcoat bears subtle hallmarks of quality – from the pick-stitching that dots the length of its sizeable lapels to the subtle herringbone that is pattern-matched across the ticket pocket. One, that recalls a somewhat nostalgic era when rail travel boomed and travelling gentlemen are dressed to impress. Paired alongside a fine navy or tweed suit, the overall ensemble creates a more masculine look. 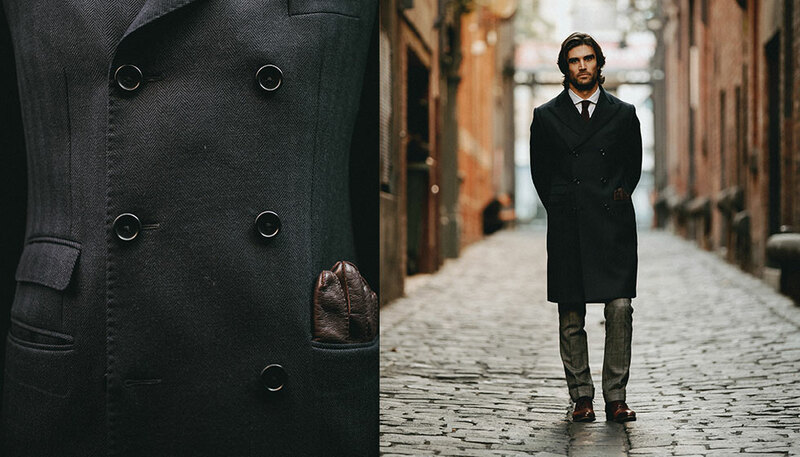 Some overcoats are meant to blend in; while others are designed to stand out. The combination of an oversized herringbone pattern, contrasting top collar, and generous peaked lapels leaves no doubt just where this garment stands. Fitted with our in-depth knowledge and understanding of the male silhouette, we also find the fabric most flattering in a double-breasted with 4 x 2 button configuration. Paired alongside a classic navy or midnight business suit, this is one overcoat that is unlikely to be forgotten soon. 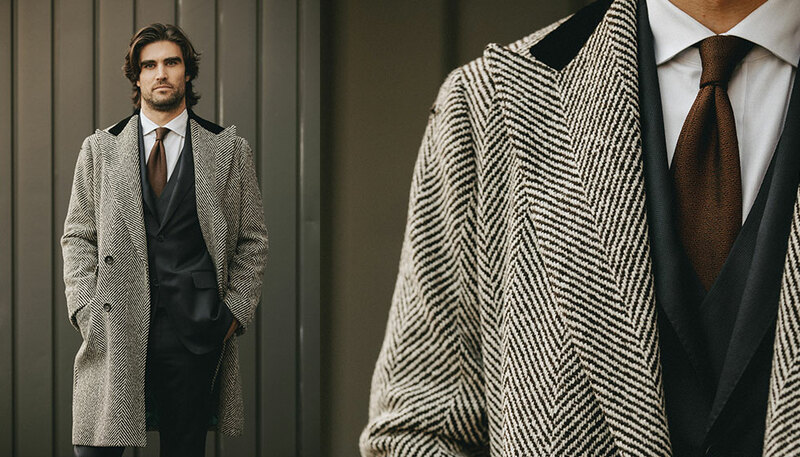 An unstructured, single-breasted overcoat set with a contrasting windowpane pattern can be worth considering while building a sartorial wardrobe. Using a lighter weight wool and without the extra canvassing, a three-buttoned garment such as this, pictured above, has a dandified feel also ideal for a more casual context. With or without the suiting underneath, the overcoat can carry one into the weekends – think merino-cashmere blend knitwear, heavyweight denim jeans, and chelsea boots. Dark colours are a winter staple, leaving an opportunity for the sartorially inclined to stand out from the crowd via careful consideration of colours and textures – a casentino coat here is a good example. A lighter hue opens up a different style ethic that can be paired effortlessly with several suiting colours such as charcoal greys and midnight blues, as well as various patterns including pinstripes and prince of wales checks. Double-breasted with a 6 x 2 button configuration, notched lapels and patch pockets, the casentino overcoat is indeed as practical as it is fashion-forward.